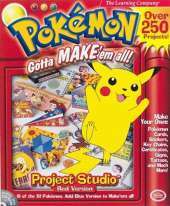 This program lets the user create all kinds of Pokémon-related projects such as calendars or greeting cards. Dutch, German, Italian and French versions have been released by Mattel Interactive. Each version had stock artwork of 81 different Generation I Pokémon (including Mew). Common favorites like Pikachu and Squirtle were available in both versions, but some Pokémon were version-specific—for example, Kangaskhan was only available in Blue version, whereas Tauros was only available in Red version. Stock art of human characters like Ash and Professor Oak was also included, and users could also add photos and images saved on their own computer. Put your favorite Pokémon everywhere. With over 600 different graphics, 81 of the 151 characters, and 250 different Pokémon projects, you can spend hours building your creativity and imagination. With both versions installed, users have access to all of the Pokémon from both games. Types of available projects: Greeting Cards, Signs, Birthday Kits, Banners, Photo Fun, Stationery, Character Cards, Envelopes, Calendars, Postcards, Crafts, Certificates, Stickers.